On April 20th, just in time for Earth Day, Disneynature is taking movie goers deep into the forests of Africa with the release of CHIMPANZEE, a new true-life adventure that introduces us to the adorable young chimp named Oscar and his chimpanzee family. Featuring Disneynature’s signature breathtaking, never-before-seen footage, CHIMPANZEE showcases the intelligence and ingenuity of some of the most extraordinary personalities in the animal kingdom. In the spirit of the film, and to further do their part to help protect these amazing animals, Disneynature is launching a “’Like’ Us, Save Chimps” program on their Walt Disney Studios Canada Facebook page today – and they need your help! If they can reach 22,000 “likes” on their Facebook page (facebook.com/WaltDisneyStudiosCanada) by Sunday, April 22nd – Earth Day, they will adopt two orphaned chimpanzees through the Jane Goodall Institute of Canada’s Chimp Guardian Program. The two certificates of adoption will later be shared with fans on their Facebook wall. 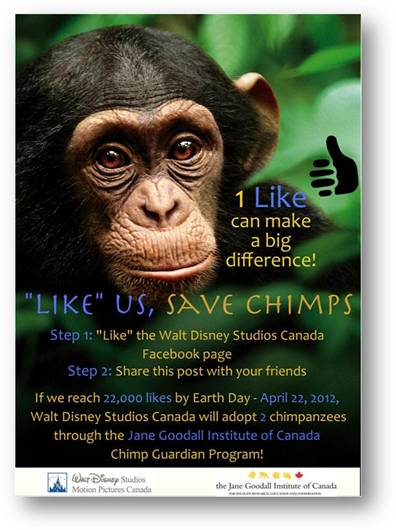 “Share” the post on our page about the “’Like’ Us, Save Chimps” campaign. The fine folks at Disney have provided me with 1 family pass for 4 to see CHIMPANZEE for Toronto to giveaway to one of my readers!! 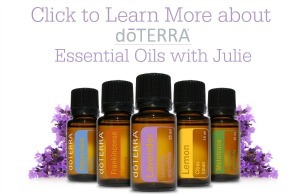 Enter by filling in the Rafflecopter form below, winner will be chosen April, 11th. I would bring 3 of my 5 kids with me to the movie if selected.